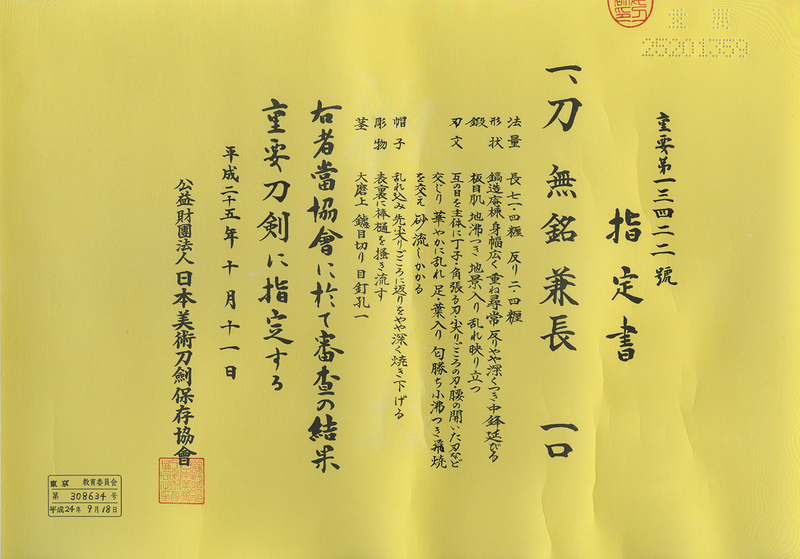 Signature : Mumei (unsigned) attributed as Kanenaga. This sword belongs to Saijo saku (the top) ranking. The blade is polished by highest polisher. Blade length : 71.3　cm or 28.1 inches. Sori : 2.2 cm or 0.87 inches. Width at the Hamachi : 3.17 cm or 1.25 inches. Width at the Kissaki :2.3 cm or 0.91 inches. Kasane : 0.73 cm or 0.29 inches. Shape : The blade is Oosuriage Mumei (cut shortened from stem of the blade) rather wide and thick with deep curve, having long Kissaki nice looking shape. Jigane : Itame-hada and Mokume-hada mixed with Jinie attach Masanagare and Chikei work. On Jigane, clear active Utsuri appear. Hamon : Small Notare Gunome Midare, Koshibiraki Gunome midare and also Yahazu-ha mixed up. In Hamon, Yo, sunagasi and Kinsuji work. 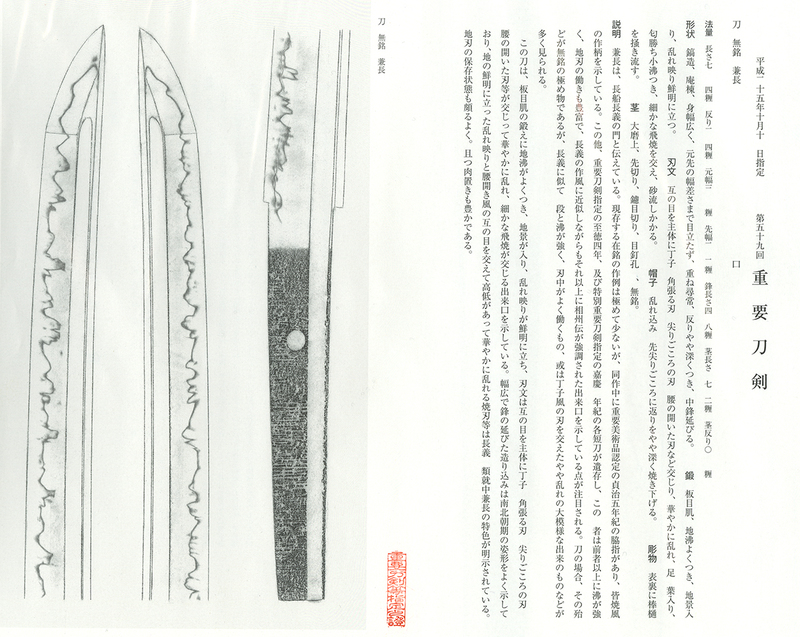 Special feature : Kanenaga was a student of the Chogi and only few swords has signature remaining. The sword has stronger Nie and wild feeling than his master Chogi. This sword was polished by Sashikomi style so it is easy to see the texture and Utsuri and also inside of the Hamon. The blade is wonderful without any Kizu or flaw. 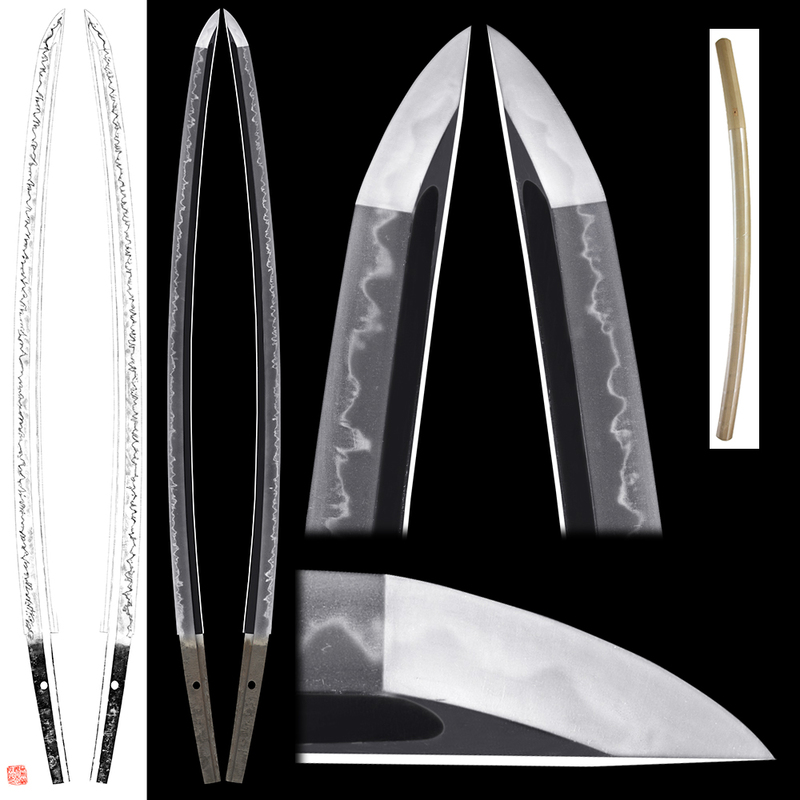 I think This blade is one of the top ranking Kanenaga. We strongly recommend this sword for you.